What we know of its history goes back two thousand years to the time when the Romans came to Wales and established a ford at Tintern on the march towards the forts of Usk, Caerwent and Caerleon. At low tide you can still see on the other side of the river, opposite the church of St Michael’s, the remains of the cobbled causeway leading down to the river, and on the Tintern side you can trace the route as it climbs out of the river at Fryer’s Wharf and uphill past the Parva Farm vineyard. The latter was probably first cultivated by the Romans themselves, and there are extensive remains in the area of Roman industrial and domestic life. A couple of hundred years after the withdrawal of the Romans from Wales the Kingdom of Gwent emerged, and in the 6th century one of their great kings, Tewdric, after retiring to a hermitage in Tintern, re-emerged to defeat the invading Saxons at a mighty battle at a site nearby still known today as Pont-y-Saeson (Bridge of the Saxons). It is likely that at this time the village acquired its name – ‘Tyndyrn’, which means ‘Fort of the King’. It was in this period too that King Offa built his famous Dyke, an earthwork ditch and rampart designed to defend his territory of Mercia against the Welsh kingdom of Powys, and you can still see part of the southern end of the 170 mile long dyke near the river bank opposite Tintern Abbey. By the 7th century a Christian community was well established in the Valley in what is now called Tintern Parva (Little Tintern), and the church of St. Michael’s dates from 765 AD. It was re-built in the middle Ages and the South Porch with its finely groined vaulted roof remains from that time as do many of the internal roof rafters and braces and three of its windows. The Victorians bricked up the priest’s entrance door in the chancel but the outline may still be seen. 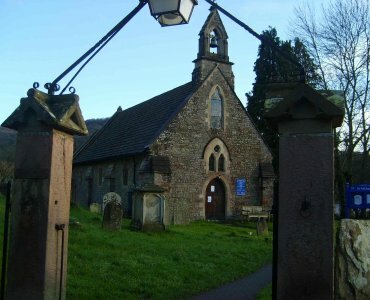 The Church was extended from the South porch in 1846, and sitting of the banks of the River Wye, and with the Wye Valley Way running through its churchyard, this special site still receives many visitors.